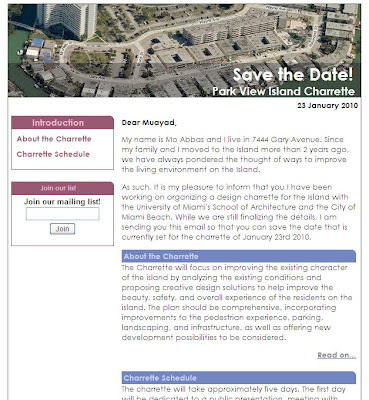 Park View Island Charrette: "Save the Date" email sent out! "Save the Date" email sent out! The date has been set for the Charrette! A 'Save the Date' notification was sent out for all interested parties. Join our mailing list if you are not already to stay informed. Thank you for the charrete. What has been the follow up thus far with the students after the sketches were provided. Any further feed back from the city? ?